When I was younger, I liked routine. I wore the same pair of socks every day, watched the same three Disney movies on repeat, reread the same books until I memorized them. There was order, and that comforted me. When things didn’t follow the plan, didn’t fit into the guidelines I had outlined my life to be (to whatever extent a five year old can do such a thing), I was upset. Like, total meltdown upset. I shouldn’t be speaking in the past tense, because this is exactly the same way I operate now. While I’ve grown, expanded, tucked away more parts of the world into me, I still stuff myself into boxes, rhythms, routines. I’ve set up specific ideas about myself and about my life. I have folded my identity between book covers and into tiny kitchens–and I like that. I like taking the same train to school every day. I like coming home at the same time every evening and knowing what I am going to find. But maybe I shouldn’t. This is where the coping comes in. Inevitably, this routine will change, and it’s not like it hasn’t in the past. Maybe it’s time to find a new routine, new places to scatter my identity. I have to remind myself of this every now and again, because thinking about this stuff is scary (but I think that’s okay). So to kick off my new philosophy, I’ve decided to start with something small: winter. I think that maybe if we just ignore the cold for long enough, it’ll go away. 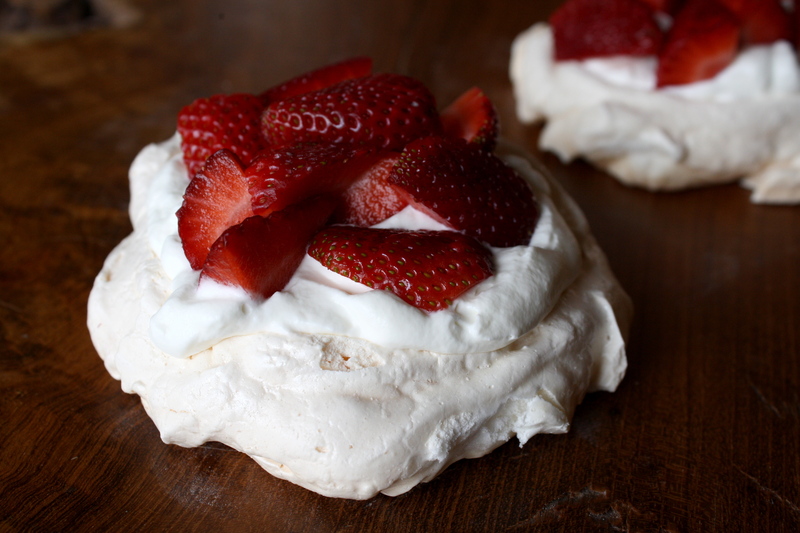 These pavlovas can do that. Light and bright; not cloyingly sweet but sweet-enough; crisp cookie coating pillow meringue under velvet whipped cream and oozing berries. Winter doesn’t stand a chance. One step at a time. Here’s hoping that by the time you read this, it’s above 50 degrees outside! Line a baking sheet with parchment paper. Trace small circles (use a cup as a guide) on the paper. In a small bowl, combine the sugar and cornstarch. In another bowl, combine the vanilla and vinegar. In the bowl of an electric mixer, beat egg whites until very soft peaks form. Add the sugar, a few tablespoons at a time. Beat until stiff peaks form. Drizzle vanilla/vinegar mixture over the egg whites and beat just until combined. Plop the meringue onto the center of each circle and, using a spatula or knife, spread it into a circle like a nest: building up the edges with an indent in the middle. 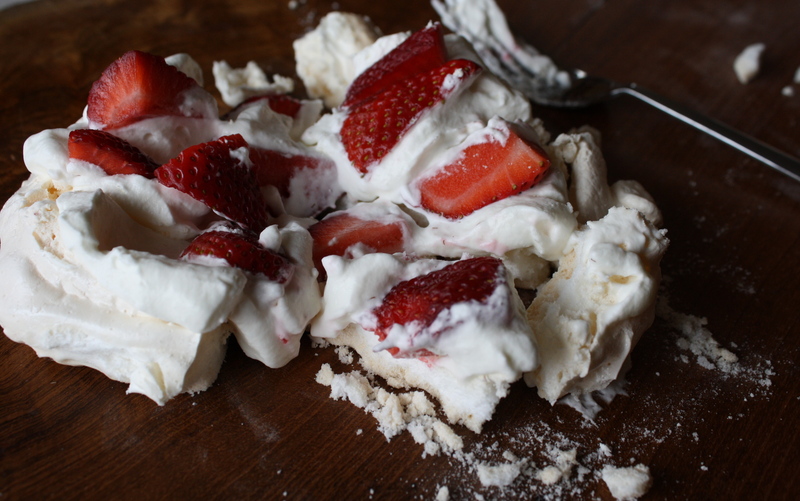 Transfer meringues to oven and immediately lower the temperature to 250 degrees. Bake for 50-60 minutes, until they are dry and have taken up a little bit of color. Once baked, turn oven off and let cool in the oven, with the door propped open slightly. 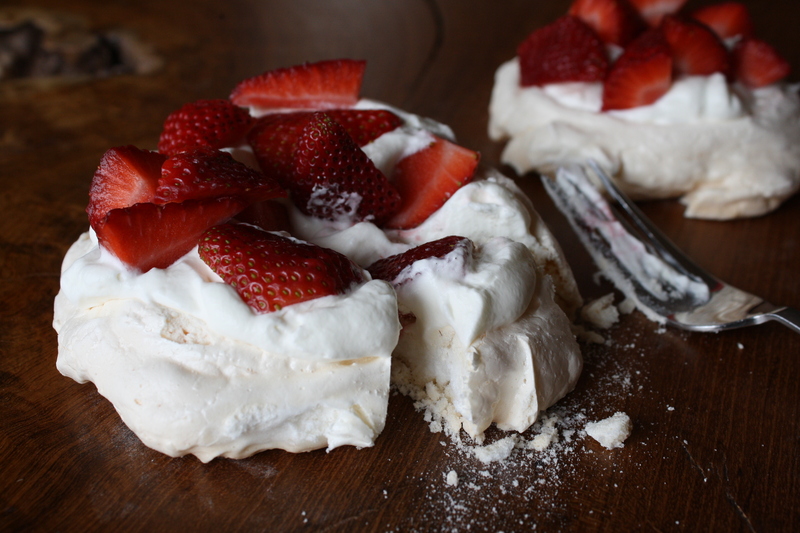 Generously fill each meringue nest with whipped cream, and then top with a healthy mound of berries.